Every year when the Brownlow rolls around I get super excited to see the WAGs hit the red carpet. I'm not a huge fashionista myself, but I do love admiring these gorgeous girls shine - at least for the the night. It amazes me how much effort goes into one night, and how often these girls nail their look year after year. No Brownlow night would be the same without the appearances of Rebecca Judd and Nadia Bartel. These two are pretty much known as queens of the carpet, although this year they both strayed from their usual style. Judd's Egyptian inspired dress was made 24 hours prior to the event, with beads swinging below her knees. Rarely do I see her in anything but classic and sophisticated, so this surprised me. I'm not entirely sold on the dress but I do like that she went for something interesting on what is supposedly her last Brownlow ever. I loved how Bartel glowed in her pale pink number, perfectly fitted for her pregnant body whilst retaining elegance. The intricate detail on the sleeve and train keeps the dress from being boring. Recently engaged Jessie Habermann wore perhaps the most extravagant gown on the night. Whilst I love the back, I'm not particularly fond of the front or the feathering hem. I still think she looks stunning though and the ring shone throughout the night. I can definitely see her as being the next big name for the red carpet in years to come. My personal favourites though come down to Keely Meehan and Clementine McVeigh. Some people would disagree, but the lace detailing on Meehan's shoulder is something that drew me to the dress. 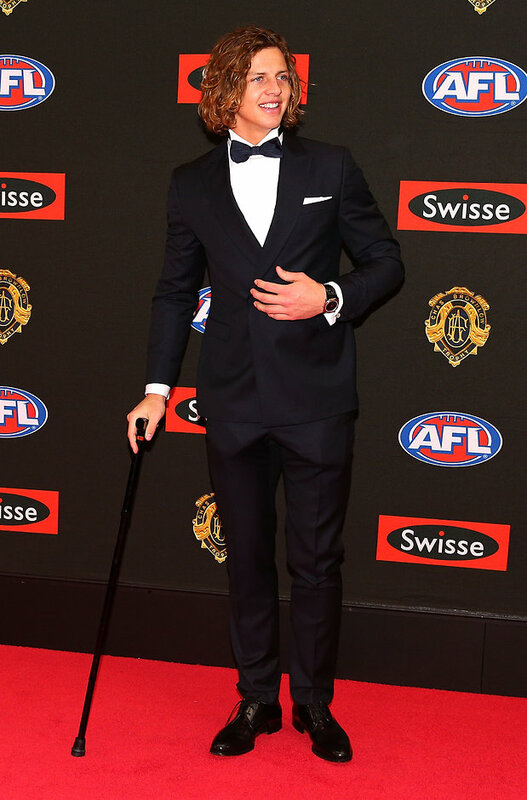 McVeigh was by far the best dressed of the night. Her turquoise gown had a deep neckline that hugged her bodily perfectly before flaring out at the bottom. It was classy and elegant, and the colour was different to many other dresses. I also loved that she kept her accessories minimal, and her hairstyle emphasised her sophistication. 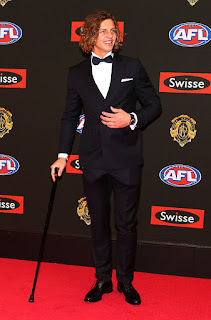 Still, no one could go past Nat Fyfe and his cane. He looked absolutely dapper and I just thought he deserved a shoutout - also the fact that he won the actual aware of the night says a lot.